When I develop your one day website, there are some amazing resources included. One of the reasons I can develop your website in just one day is the careful choice of theme and plugins that I make use of to develop your website. So you get the benefit of my experience in choosing the best tools for you! Ease of use for my clients: WordPress is very easy for our clients to get up and running with quickly with very little learning time required. Most used CMS with many options: WordPress is the most widely used content management system in the world, everything you could possibly need to accomplish you can do with it. I use the powerful, robust and simple Beaver Builder Theme for my site developments. I’ve built dozens of sites with it, including my own, and it really has all the options required for your website. I recommend it because it’s extremely well written and light as well. I have worked with many themes in the past including those from the Genesis Framework and others. My first choice is the Beaver Builder Theme as this works best for my clients. Teamed up with the Theme mentioned above I also make use of the Beaver Themer theme designer to customize your theme completely for you. This allows for any unique design elements you may need in your Header, Footer, Blog Posts, etc. so you can let your creative marketing ideas run freely. Beaver Builder Plugin – Beaver Builder is a powerful and flexible drag and drop design system. It allows you to easily edit the content of all your pages, without needing a degree in web development to do so. You will be equipped with all the tools you need to edit your site once we’ve developed it for you. Saving yourself a lot of future costs. Beaver AddOns – This PowerPack adds 30+ custom modules to the Beaver Builder Plugin that will boost your productivity and give you many more options like pop-up boxes, fancy headings, etc. It also offers many pre-built page templates that you can use to create more pages going forward on your website. All In One Schema.org Rich Snippets – This tool can really improve your click through rate from search engines like Google and anywhere else Rich Snippets are supported. Gravity Forms – This is a powerful plugin allowing for any sort of form to be created that you may require. Yoast SEO – The plugin we recommend to help you to add great Search Engine Optimisation (SEO) keywords to your pages and blog posts to help google find you. Tidio Chat – If you want a live chat facility on your website, this is the one we would recommend for you. UpdraftPlus – We recommend our clients set up a facility that backs up your website daily and off server. This free tool is ideal and can backup to your cloud service like DropBox or Google Drive. In addition to the above standard plugins, I can recommend many others should your needs expand, e.g. if you require a membership facility, online learning management system, e-commerce online shop, or marketing automation system. Speak to me if you need more than my standard site solution above and I can make recommendations for you and quote accordingly. 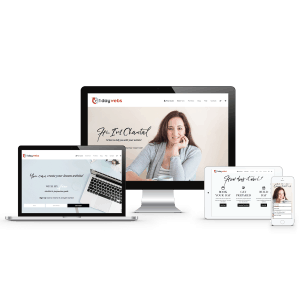 Once I have set your site up with all the above tools, I spend 8-10 hours customising and building your site with your provided branding, content and my recommended templates. 3 Months Free Support & Maintenance (updates to WordPress, theme and plugin only – not including content changes) thereafter you can continue to maintain your site yourself or sign up for my Website Care Plan program where I will continue to maintain your installation for you. 1 Year worth of Theme & Plugin licensing – thereafter you will need to renew these annually to continue to receive product support and updates. Now that you understand the full value of what your one day website build entails, click Read More on book your day! ← What does a WordPress website cost? Even if you DIY it!